Survivor Diet Challenge: Day 36 - Stop. Thief! I have been stockpiling killies all week again down by the boat ramp in preparation for Saturday morning fishing. I had a bunch of nice big ones which I'm sure will produce very respectable fluke in the river. The wind picked up pretty heavily this morning from the Northeast but i was going to give it a shot anyway. The tide table let me know that the best time to go would be around 8:30am. I trailered the boat to the ramp and walked over to pull up my bait bucket and trap. Low and behold, they were empty! Someone had stolen all of my precious bait and had left my bucket behind. I was absolutely furious! I had just re-baited and checked it the night before and the only people using the ramp this early were the fishermen who left before me. I had no way of knowing who it was but I was so mad it hurt. I was determined not to give up hope however. I remembered about the fluke strips that I cut from those fish that I accidentally let go bad the other day and I went back home to retrieve them from the freezer. These may not work as well as killies but they should do the job. The wind sure was howling but luckily the wind and the tide were going in the same direction. This made for a really fast drift which I like. In just about 2 hours I am happy to report that I caught about 12 nice fluke - keeping 5 to take home to eat. The alternate bait worked and what makes me more happy is the fact that I was able to utilize the bait that I made just the other day. Those fish were not wasted after all and I was basically able to convert 3 dead fish into 12 new fish today. And without that bait I may not have gotten any at all. I was able to turn a mistake into a fortunate event and I am very happy about that. I was quick to remember to get these new fish on ice as soon as possible. Through this learning process I have also developed a system of freezing big blocks of ice in my garage freezer so that I never have to buy ice again to chill fish (hopefully). After icing the fluke I decided to try to make another primitive fire in the backyard. One more weekly reward would really help to make the rest of this week a breeze. I gathered all of my equipment and my knife and started spinning away with my hand drill. It took several attempts and I was close to quitting several times but in the end I got it done. My little baby ember came to life and allowed me to make a flame from a cedar bark tinder bundle. From this, the fire grew and grew as I kept feeding it fuel from scraps of wood strewn throughout the yard. I successfully unlocked my third reward consisting of a dozen eggs, a bag of flour and some yeast. I have a plan to start the bread making process and as long as I moderate and do not over eat it, the bread will be a welcome addition to my diet. I can also 'officially' make my own breadcrumbs and have a few pieces of breaded fluke - my favorite. I followed an old recipe I had in the memory bank - 3 cups of flour, 1/4 teaspoon yeast, 1 1/4 teaspoons of salt, 2 cups of water. This will be the start of my favorite bread boule. Couldn't be simpler and it usually comes out fantastic. This mixture of ingredients will sit overnight and be ready to bake sometime tomorrow after rising. 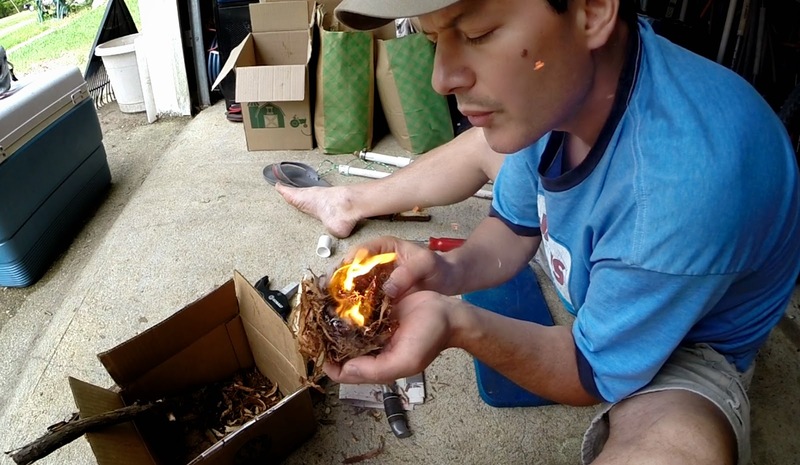 I used the hot coals from my fire to heat a tin foil bag filled with wood chips to be used on the smoker grill. I had dried a batch of bluefish and fluke strips the night before and it was time to add some smoke. The hot fire did a great job to ignite the wood chips and after a quick dowse of water it was ready for the smoker. A few hours of smoking, followed by a couple hours of dehydration will yield a nice batch of jerky for the next few days. This is my first attempt at fluke jerky. It is not a very oily fish like bluefish so it should be interesting to see how it turns out.